There is a MOOC about Dante Alighieri's Divine Comedy by the The University of Naples Federico II, in which a certain professor named Raffaele Giglio starts a video (published in September 2017) in which he recites some verses from the work. I already become very suspicious about any credibility of this professor when he immediately afterwards uses the following vague words: "the greatest Humanity poet". ...in his comedy, the book which, after the bible, has been translated into the most languages and dialects in the world, and is the top printed work of all time, after the Bible. ...nella sua commedia, l’opera che dopo la bibbia è più tradotta nelle lingue e dialetti del mondo ed è quella più stampata sempre dopo la bibbia. NOTE: It seems to be fashionable for some professors to shout that a book of their interest is the second most translated book in the world. In April 2016 for example, Alfredo Moro, who lectured at the University of Cantabria, claimed this for Don Quixote. One way to address this question is by quantifying the relative importance of Dante vis-a-vis other poets. 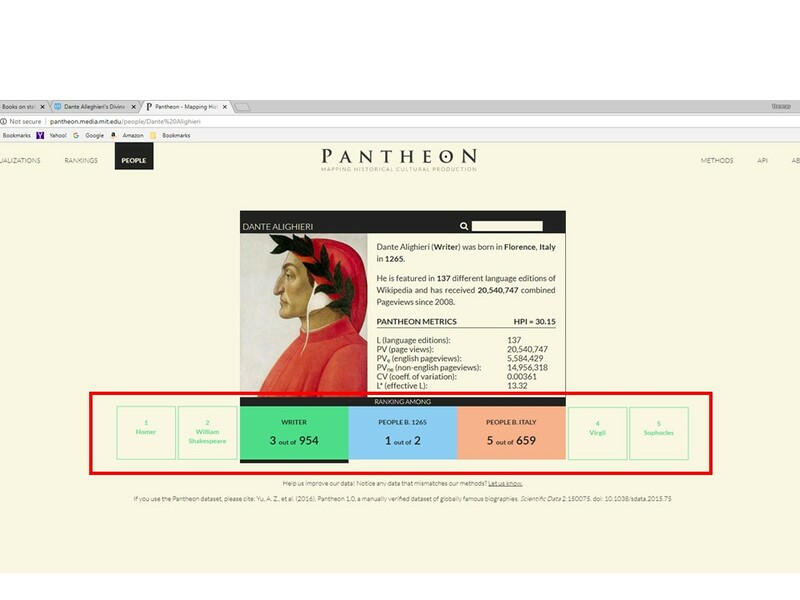 MIT's Pantheon project is one resource for this (http://pantheon.media.mit.edu/methods). The link is to their webpage describing their methodology. Basically, Pantheon's project is an attempt at measuring Global Historical Popularity. Among the metrics they employ for selecting global popularity is the number of languages in Wikipedia into which an historical figure's work has been translated (minimum of 25 for inclusion into list). Among the limitations to their approach is the fact that the metrics are based solely on Wikipedia which is far from objective as it heavily weighted towards historically Western figures. Without getting lost in the weeds of what Pantheon does and how they do it, Dante Aligheri ranks 3rd among Writers, a pre-determined Pantheon classification. First is Homer, then Shakespeare. Dante is followed by Virgil and Sophocles is fifth. The image below can be found on this webpage (http://pantheon.media.mit.edu/people/Dante%20Alighieri). Based on Pantheon and Wikipedia, Dante has been translated into 137 wiki language editions, Homer into 141 and Shakespeare into 163. Clearly the number of translations is not the only factor used in generating the results. Dante was an indisputably great poet. That MIT's Pantheon ranks him 3rd is an almost arbitrary decision since any and all rankings can be reformulated to produce virtually any desired result, e.g., see Malcolm Gladwell's takedown of college rankings in this New Yorker article... https://www.newyorker.com/magazine/2011/02/14/the-order-of-things or this infographic summarizing all of the factors Google uses in creating its Pagerank metric for keyword searches ... https://blog.hubspot.com/marketing/google-ranking-algorithm-infographic. Not the answer you're looking for? Browse other questions tagged translation italian-literature dante-alighieri divine-comedy or ask your own question. What are the challenges in translating a work of literature? What is the oldest non-biographical work of literature in which the author is also a protagonist?